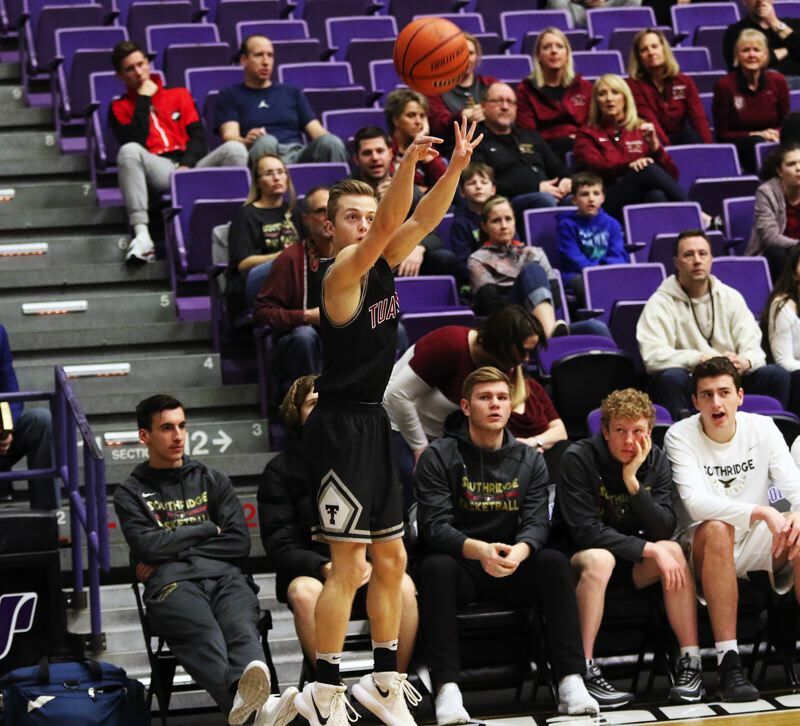 PORTLAND — At first glance, the Tualatin High School boys basketball team appeared to be possibly overmatched. 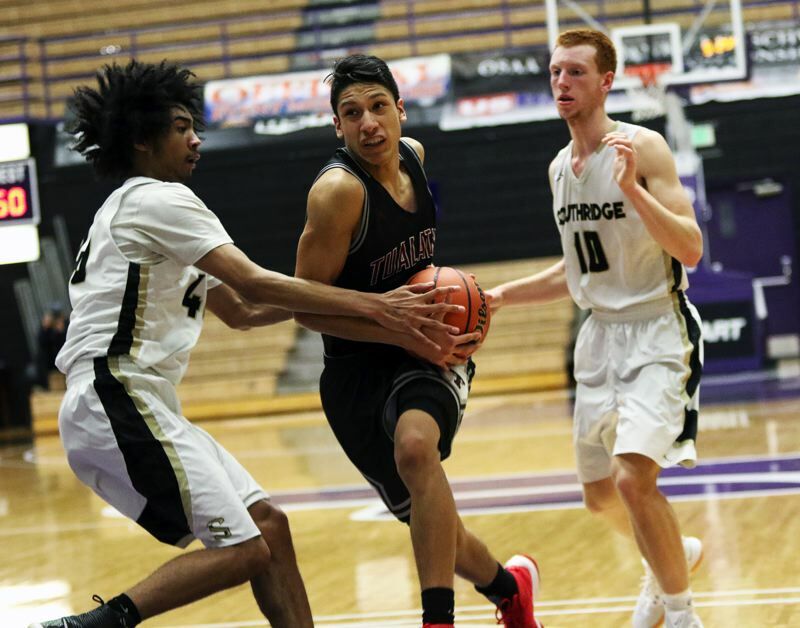 After all, the Timberwolves were facing a towering Southridge team, with a pair of starters standing 6-foot-10 and 6-8, while topping out at 6-4 themselves. It was also a talented Skyhawk squad, which won its first-ever Metro League championship and was the No. 3 seed for the Class 6A state tournament. But, none of that seemed to matter to the Tualatin team. As always, the Wolves were ready to battle hard, and battle to the end. And, the battle-tested Tualatin squad nearly came away with an upset win to show for it. 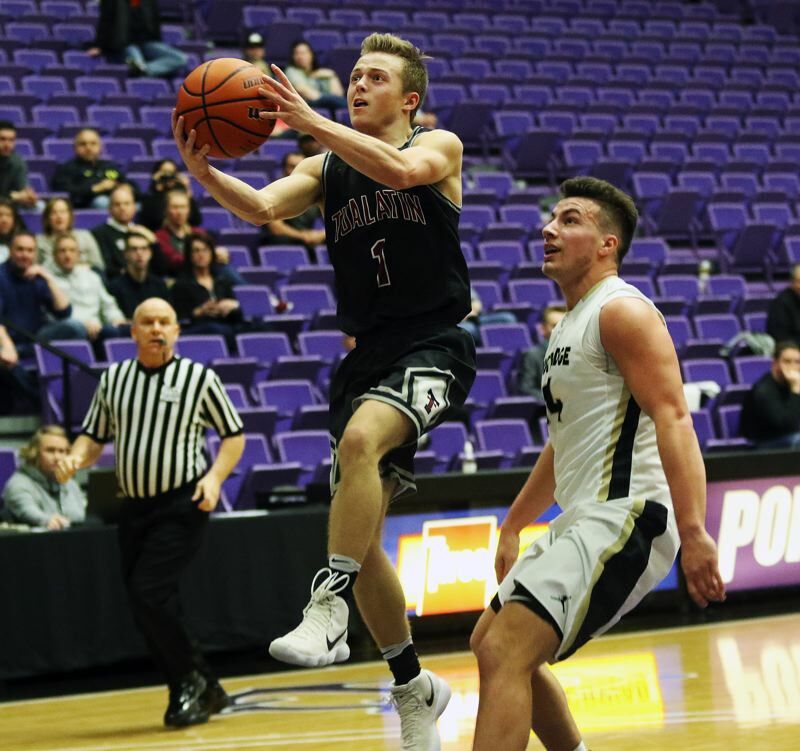 The Wolves, coming back from an early deficit, and then nearly coming back again late in the contest, were edged 66-60 by Southridge in a state tournament fourth/sixth-place game, played Saturday at the University of Portland's Chiles Center. "We don't fear anyone. 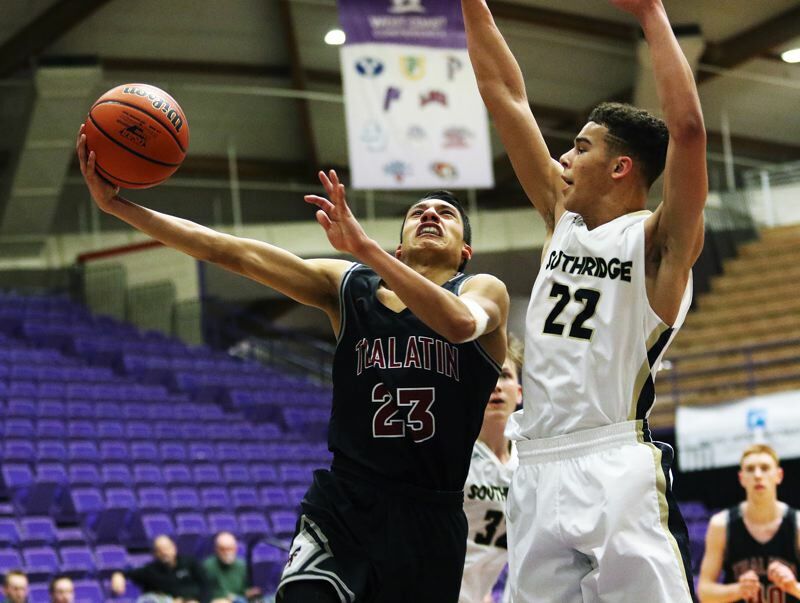 We've always been the shortest team, but we have our strengths that we play to," said Tualatin senior wing Alexis Angeles, who scored 33 points in the contest. "We went out and gave it our all, and that's all you can ask for. That's just how our team is. We're resilient, and no matter what the score is, we're going to keep battling for each other. We just hope we represented Tualatin High School and the city of Tualatin to the best of our ability." 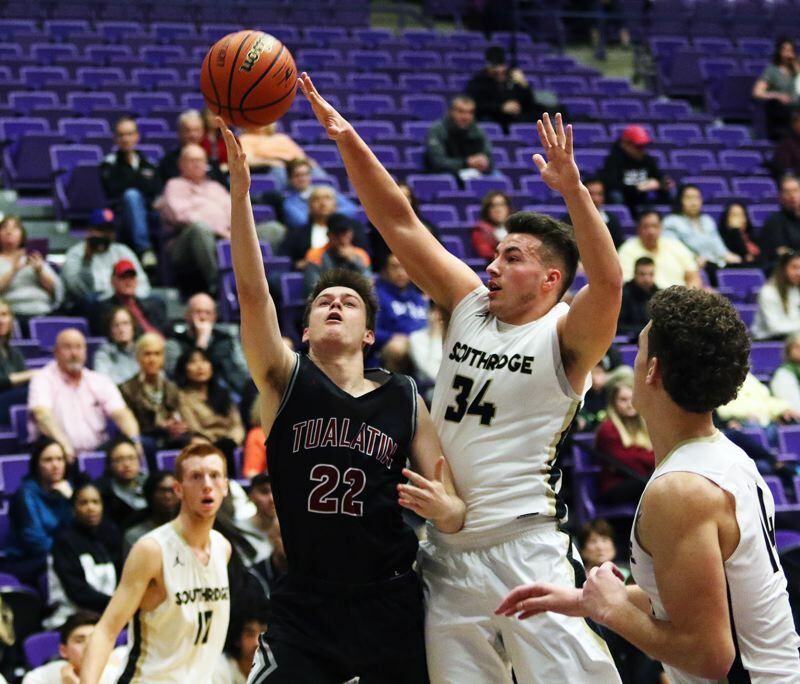 "It was a tough game, but we battled," Tualatin senior post Chris Freese said. "Obviously, they had some height, but I thought we battled. We're undersized most games, but we still played hard. Kind of what we live for." With the win, Southridge finished its season with an overall record of 25-4, as well as the fourth-place trophy from the state tournament. Tualatin, the No. 4 team out of the Three Rivers League, and the No 12 team in the final OSAA power rankings, finished its season with a final mark of 19-10, as well as the sixth-place trophy in its first state tourney appearance since 2008. 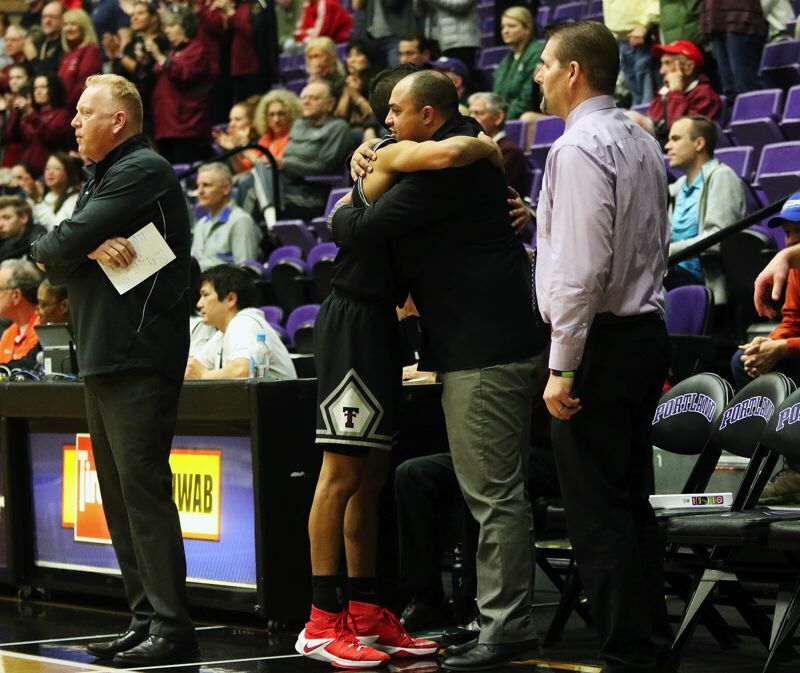 "We definitely had our ups and downs, but I knew this team had the fight and the guts to pull through," Tualatin junior wing Caden Dickson said. "I know that much wasn't expected for us, because our team is so small, but having a run like this was great for our team. We loved it." "I thought we did more than most people thought we would. I think we overachieved our expectations," Freese said. "Our goal was to make it to the tournament. Obviously, you're disappointed not getting more. We wanted this game, but it was a tough loss." "A lot of ups and downs, but the team stuck together, and look where we ended up, at the Chiles Center," Angeles said. "Our dream was to make it to the Chiles Center. We weren't even ranked in the top five coming into the season. No one thought that we were going to be here, but here we are. It was a huge accomplishment, and there's no other team I'd rather finish my high school career with." Southridge, in Saturday's game, got off to a flying start. The Skyhawks grabbed an early 11-3 following senior Brady Bickler's layup, coming off a pass from junior Zach Galvin, coming with 5 minutes and 4 seconds left to play in the first quarter. Tualatin, with Angeles scoring three baskets in the final 2:52 of the period, cut the lead to 15-12 going into the second quarter. That's when the Wolves started rolling. Dickson's basket on a 19-foot jumper tied the game, at 17-17, with 6:25 left before halftime. Southridge, getting a 3-pointer by 6-10 senior forward Filip Fullerton, and a pair of free throws by senior guard Bo Quinlan, came back to claim a 22-19 advantage with 4:50 left in the quarter. 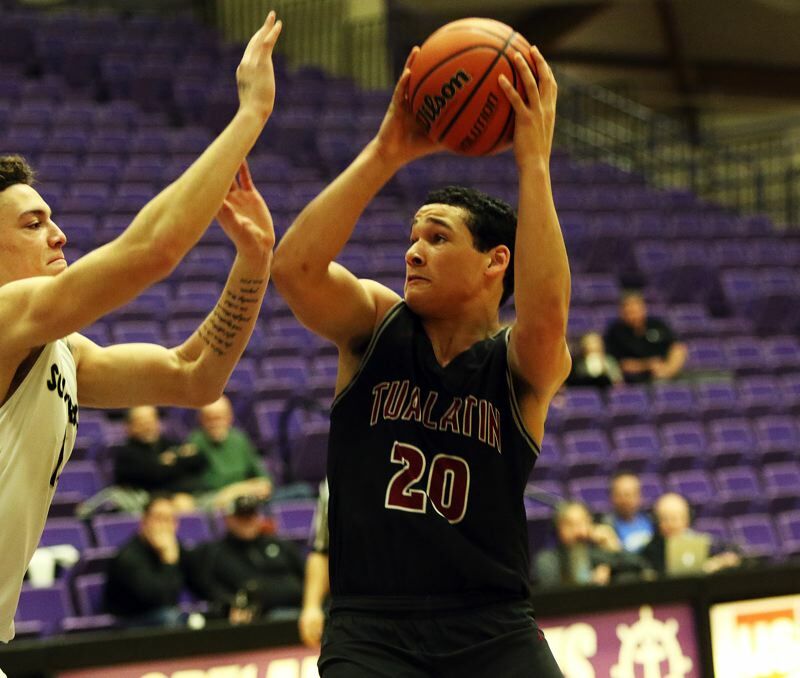 But Tualatin, with Angeles scoring the final six points of the period, including a layup off a pass from Dickson following a steal, rallied to grab a 25-22 halftime lead. The Wolves defense looked to be a key factor in the second-quarter comeback, as they helped force nine turnovers in the period, while also holding the Skyhawks scoreless over the final 4:50 of the half. "We were able to fly around on defense," Dickson said. "We got tipped balls that led us to get buckets in the transition." With momentum on its side, Tualatin kept up the pace in the third quarter. Baskets by sophomore John Miller and Angles, and a 3-pointer by junior Jack Rose, off a pass from senior Nathan Platter, gave the Wolves a 32-28 lead with 5:42 left in the period. 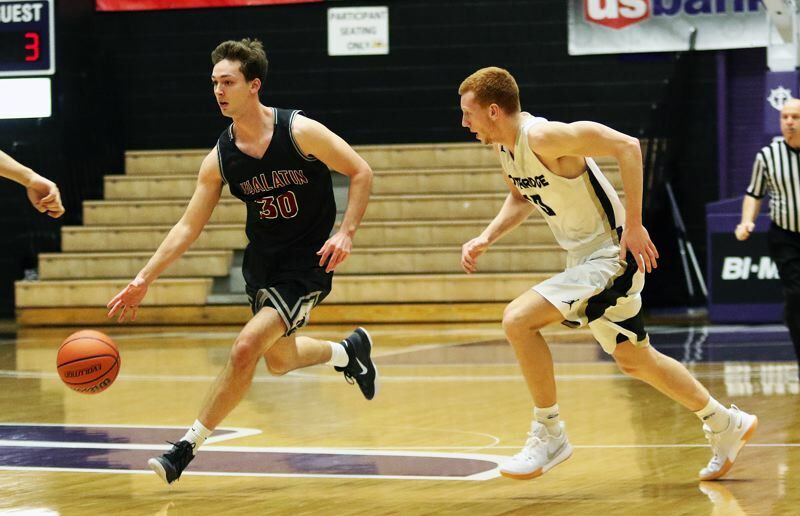 The Tualatin lead was still four, at 39-35, after Dickson drilled a 3-pointer, off an assist from senior Lucas Noland, with 2:39 remaining in the third quarter. But the Wolves weren't able to score again in the period. 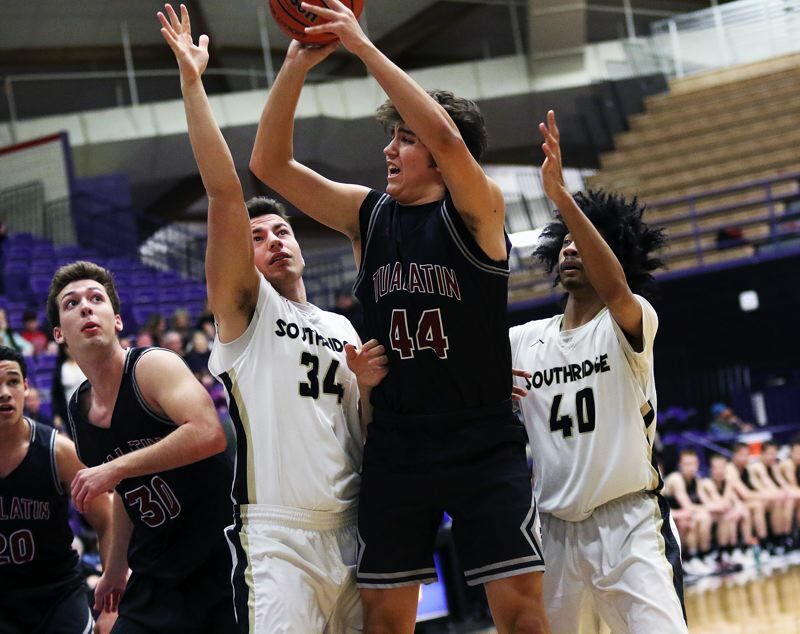 Meanwhile, Southridge, getting five straight points from Fullerton, a 3-pointer by Galvin and a basket on a buzzer-beating 16-foot jumper by junior Kade Hustler, rallied to take a 45-39 lead into the fourth quarter. The Skyhawks kept rolling in the final stanza, and opened the biggest lead of the game, at 53-41, when Fullerton sank a foul-line jumper with 4:29 left in the game. But the Wolves tried to battle back. With Noland sinking a 3-pointer, and with Angeles scoring back-to-back buckets, they trimmed the margin to 55-48 with 2:21 remaining. Southridge was able to get the lead back to double digits, at 58-48, following a free throw by Galvin with 1:17 left to play. 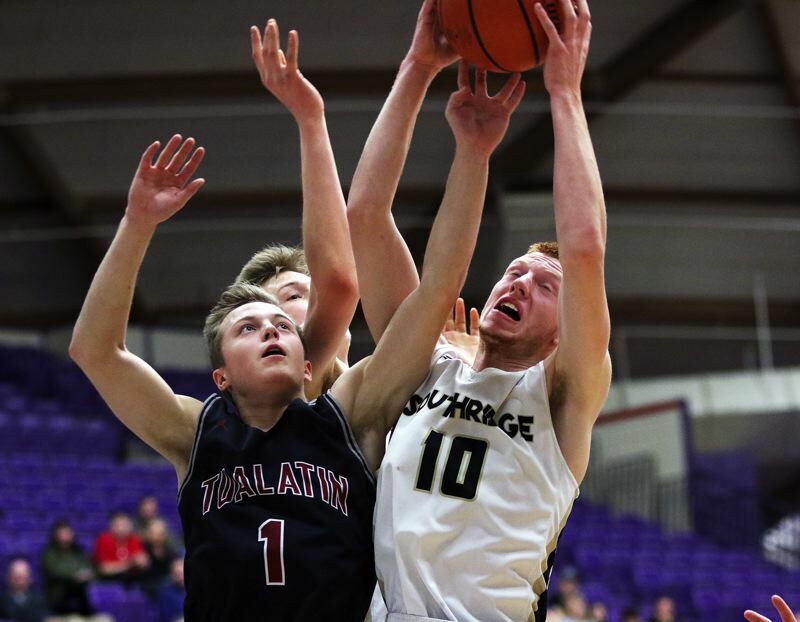 Tualatin, behind the play of Angeles, cut the lead to six a couple times, but Southridge was able to close out the 66-60 win. "It's the story of our season. As a team we just battle no matter who the team was. We just battle them and try to get the 'W,'" Freese said. "It's nice. As a senior, I was expecting to have a good season, but I didn't know how far we'd make it. I'm happy we made it this far." "We were definitely the smaller team, and had to fight our way down in the paint," Dickson said. "We had a solid first half. We struggled to make our shots. We battled, but they were able to pull it out." 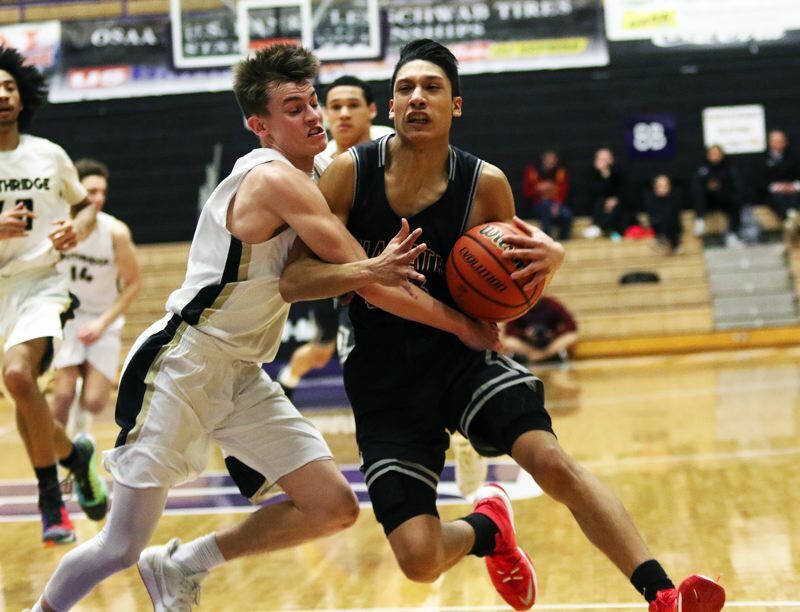 Angeles, in his fourth year on the Tualatin varsity, finished his high school career with a game-high 33 points on an 11-for-21 shooting night from the field. He also had a team-high eight rebounds, two assists and a steal. "There are a lot of great memories," said Angeles, who was a second-team all-state tournament selection. "A lot of ups and downs, but at the end of it all, it just makes a perfect story for me, and I wouldn't rather play for any high school or city." Dickson added 11 points for the Wolves. Miller had seven points and six rebounds. Noland and Rose each scored three points. Junior post Bridger Steppe blocked three shots. 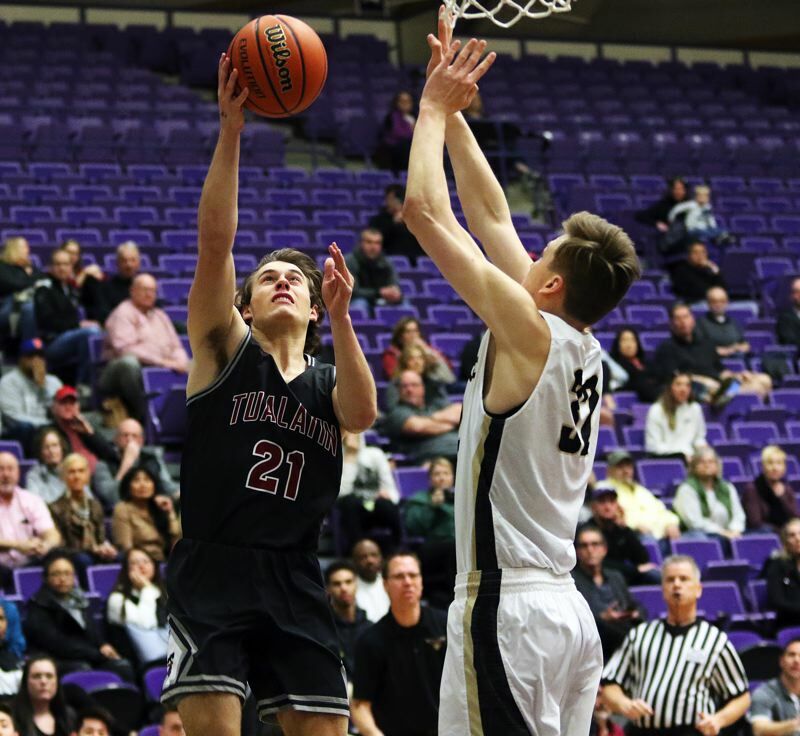 Tualatin, as a team, made 22 of 64 shots from the field, with four 3-point baskets, and 12 of 16 free-throw attempts. "Kids did a great job. They battled and competed all season. I think this game was kind of an earmark of how the team played," Tualatin coach Rick Osborn said. "We didn't back down, and we didn't back down all season." Fullerton paced the Skyhawks with 18 points and 17 rebounds in the victory. Junior guard Brock Henry added 13 points. Quinlan had 12, while Bickler and Galvin each scored eight. Galvin also had five assists and three steals. Southridge, as a team, made 23 of 51 shots from the field, with six 3-pointers, and 14 of 19 free-throw attempts. 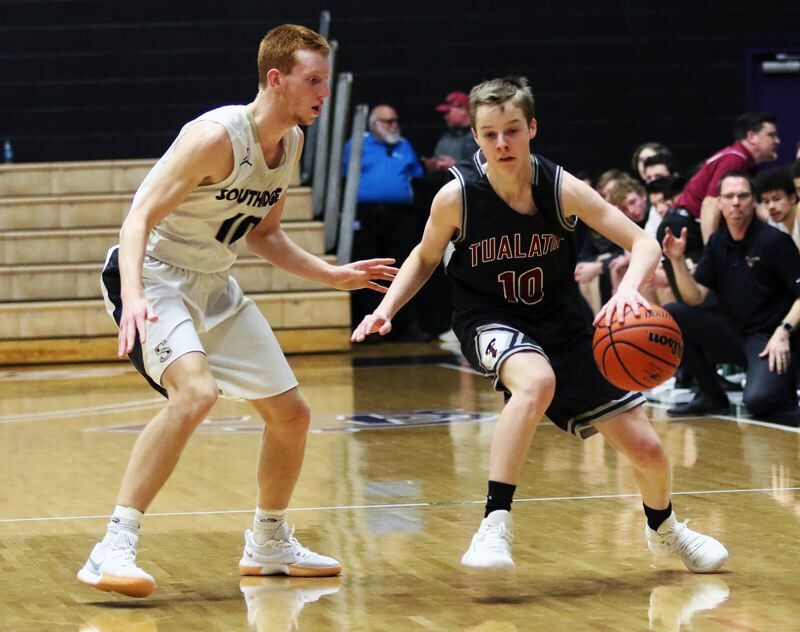 Other members of the Tualatin team include senior Matthew Kachlik, juniors Derek Leneve and Jason Wisler and sophomores David Ulwelling and Sam Noland. Todd Jukkala, Tom Duggan and Bubba Lemon are assistant coaches with the team.